There is a distinction between having a beard as part of your style and just not shaving. Anna Lee, a hair stylist and make-up artist, knows part of that distinction is the proper care of your beard. I sat down to talk with her about her line of beard care products, Brutal Beard. Photos courtesy of Rebecca Schuler. Anna: One of the reasons I got started with Brutal Beard is there are a lot of people who are newer to having beards. Especially a lot of guys who sometimes have periods of time they weren't shaving, but it wasn't like they were consciously bearding. They were just not shaving. So there’s a difference between the two and I think the conscious bearding and planning to have a beard, cultivate it and have it as a part of your style is on the rise. There's not a lot of knowledge out there reaching the guys who are interested in having a beard. They don't know what they're supposed to be using or how to use it. Eric: Yeah, I never even thought of using beard products at all. Maybe you never thought of that, and most guys don't, but maybe you noticed it's dry, it's fuzzy, it's not quite under control, and you didn't really know why. It's not your job to know why, it's the stylist's job to say, "Hey I suggest this." But for me being a biker, I have a lot of guy friends, and a lot of guy friends with beards. Being a stylist, I have quite a few male clients and in general I'm somebody that people look to when they're wondering about products, ingredients, uses, questions they don't even think to ask about, things that could be benefiting them. It's my job to give people that information. A lot of guys began asking me, "I'm starting to have a beard here. I'm not really sure if there's something I could be doing. I know it's a little dry. How do I make it not go like this?" I was at first suggesting women's products for men to use. Women’s products smell stronger, men's products have less fragrance. If something is right under your nose you don't want it smelling as strongly. And it wasn't really meant for them: it wasn't skin care, as well as hair care. It was something that kinda helped and was better than nothing, but after a while I realized that's not really going to work. Men need something for men, not only that's scientifically geared towards the need they have specifically, but also just for men, for dudes, consciously marketed for men with fragrances and branding that would attract them and not repel them like women's products do. You answered my question of why you started. I saw the need. I saw the trend growing and the guys with beards that were new to it. Why a beard oil? What's a beard oil do? What are the benefits? One of main questions I get is, "What is beard oil?" People are just not familiar with it yet. What I explain to people is it's really a maintenance product, as well as a styling product. So first and foremost it's skin care as well as hair care. A lot of guys will say, "Oil? Will this break me out? This goes on my face? Are you sure?" I tell them all the ingredients in my products are thought out, nothing is in there as a filler, everything in there is really pure. The ingredients are all natural, cruelty-free, and conscientiously sourced. But the main thing is each ingredient has a purpose. The key ingredient is grapeseed oil which is used to fight eczema, psoriasis, redness, irritation and dryness. It is skin care, as well as hair care, and it's a light moisturizer. Dryness is frizz. If it's dry then beard oil reduces the frizz, in general makes it look more kempt. Basically, style and maintenance. If you want to continue to grow it longer it will help. If you're just maintaining where you are it will help you feel good, won't be dry, will help you maintain it and not want to shave it off. A lot of guys told me, "I had an amazing beard but it was driving me nuts so I shaved it off." That happens to me. At longer and longer intervals, but eventually I'm just at the point where I don't care how this looks or how much Ilona says don't do it, I just cut it off. A lot of the times it getting itchy or dry. Beard oil is something that will help keep it going for you. You mentioned the ingredients. You're knowledgeable, I imagine that comes from you being both a hair stylist and make-up artist. So, there's the hair part and the face part. Your position gives you some insight. I'm interested in ingredients as a way to educate my clients on why something is better for them, or if two things are similar then why one may be better for them than the other. Giving that knowledge to my clients helps them take care of themself at the next level and understand what they're using and why. How did you go about choosing the ingredients? The way I formulated the base oil was partially knowledge I gained through my career and past experiences and products, and part from research. I spent months and months developing the product, and months developing the fragrances. Taking this raw idea I had, figuring out how I can make one more thoughtful and more scientific than all the other average oils out there, and make something worthwhile. If I was going to do it, I wanted to do it because I had something so much better to offer. There are a lot of beard oils out there with a lot of filler, like rice bran oil which has no benefits whatsoever. Also, the average price of beard oil is $18 for a one ounce bottle where mine is a two ounce bottle. You're a small business owner. What's that like starting up your own small business and getting that running? The true answer is I'm a hustler in general. I've got my in hands in a lot of stuff at all times. I like to stay busy and I have a lot to offer people. I feel like I'm trying to always get my stuff out there. Here's the thing — I'm a doer, I have an idea and I do it. I'm very impatient, I don't hesitate and I have to do everything 100%. I designed all the labels and marketing myself. I'm really computer illiterate so it's been interesting. I’ve gotten compliments on the labels which I laugh at because I made them. You went with simplicity which always looks good. I originally did not have the line about instructions, but I added it recently because a lot of people were confused about how they're supposed to use it. Yeah, I would need the instructions. I always forget that guys might need instructions. I'm a hair stylist and know, but my clients might not. That is the case with me. The angle for the brand I'm trying to drive is local. Cleveland supports Cleveland, and there are so many people out here venturing on this and that, and it's cool that I have something to contribute. What's the future hold for Brutal Beard? I want to continue expanding the male grooming line. Ultimately, the second tier of my master plan would be to develop a woman's line of products. Right now I'm focusing on [men's] where there's a need. With women's products, while that would be a huge passion for me, I feel like right now there's a ton of stuff out there. I'd love to throw my hat in that ring and my clients would be interested. But right now the void exists for men and that's where I'm most needed. The response has been huge. I've gotten so much interest. I've gotten feedback that made me cry it's been so incredible. Tons of repeat customers. Brutal Beard has been on sale for three months so far and I got in the black after two weeks. Right now I have two beard oils: Cedar Canyon, which is primarily cedar with notes of sandalwood and pine, and Clover Roads which has clove and a little of black pepper. Cedar Canyon seems to be popular for people that like mild and mellow. Clover Roads is spicier, kind of like what I imagine Tom Selleck's chest hair smells like. Then I have the Total Wash which is the hair, body and beard wash. That's been popular. My only regret is I wish I made that in larger bottles. I might expand that into a larger bottle eventually. That has eucalyptus notes and has a nice tingle, but it's really mild and conditioning. I was interested in that because I just use bar soap. That's not good. If you're trying to fight dryness, that's not the right thing. Something mild that conditions will make a big difference. I also recently added a mustache wax and the next product to come out will be a beard balm. I kinda describe that as having a texture of chapstick which sounds gross, but it's kind of a pomade product for hold and a conditioning leave-in balm. I'm really excited about the beard balm and think that will rule. We'll see how that stuff goes. I'm really excited so many people are interested. It means the world to me. Use Brutal Beard Oil every day. At least each morning. Also use it to refresh/restyle again before an evening out. Start out with a few drops in your hand. The amount differs for each beard depending on length and texture but you will get a feel for the right amount for you after just a few tries. Spread briefly over both palms and fingers. If you choose, follow by combing through. This helps to distribute the oil evenly, as well as shape your style. The way your beard hair dries is very important, so situate it so it will dry nicely. The end result should be a soft, moisturized beard. It should feel great, not itchy, and look completely excellent. 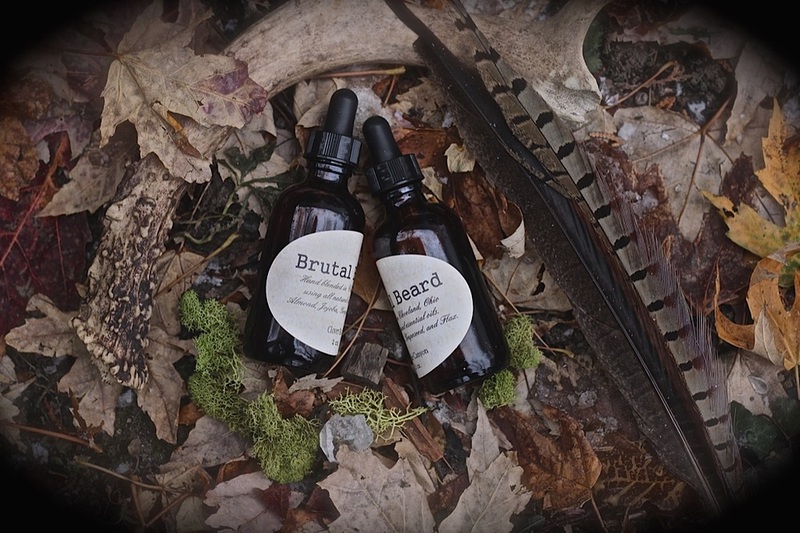 Using Brutal Beard Oils each day helps you style, as well as maintain for maximum badassery.